Investing in publicly owned Solar Energy Stocks has the promise of reward – but also involves risk. Only you can decide if it makes sense for you to consider such investments. However, if this something you are considering doing - then what we want to do in this section of our website – is to provide you valuable information and advice that will help you make an informed choice. Being actively involved in developing solar projects, which has expanded to also writing about the solar industry (i.e., this web site and our Solar News and Views Blog), we can give you our perspective on what is going on – in the hopes that it will help you to make good choices. Let's start by looking at some "mega trends"
By this I mean, that many well known companies, sports arenas, etc. have either installed solar panels on their buildings or announcing plans to. Also more and more countries are promoting solar energy as they realize that the solar industry creates jobs and energy. Another big indicator that solar is now mainstream is the growth in new utility sized projects (both CSP and PV based), which is pushing up the installed base of solar projects significantly. Generally speaking, the efficiency of PV modules is increasing year to year, while the price per watt to buy & install solar PV panels decline. Using the industry standard standard of retail price per watt of peak power (kWp), the cost of most panels is under $4.00 / kWp and this trend is likely to continue over the next few years with the emergence of improved manufacturing processes, thinner silicon solar cells, lower installation costs, and growing market shares in the marketplace from thin-film solar companies. 2010 has been a record year for new Solar Installations. According to the latest quarterly report (since 2003) issued by the Ernst and Young Energy and Environmental Infrastructure Advisor team that ranks national renewable energy markets, and their suitability for individual technologies – the long term prospects for solar are quite good now. As "The PV market remains highly volatile and cyclical in nature," says report author and PV research director Ash Sharma. "Market maturity is still some years away, and although investment in the industry presents large risks, there are also major potential rewards to be reaped, as the long-term outlook is very positive - with over 100 GW of new PV capacity being added in the next five years." Note: For more industry trends be sure to look at some of the more than 40 industry trends and forecasts we've posted to our blog. To see the full list click here. For up to date information about individual solar company stock prices and statistics (produced by click here. As you can see – First Solar and Trina have had excellent run ups in their stock of more than 1,000% in the last 12 months. Three other firms had respectable gains over 100% – but a lot of firms basically are trading where they were a year ago or have lost a considerable portion of their value. This list deals primarily with solar panel manufacturers and is not an exhaustive list of publicly traded companies in the solar industry – which would also include manufacturers of inverters, and larger companies which produce solar products. I'm working on putting such a list together – and will add it later on. 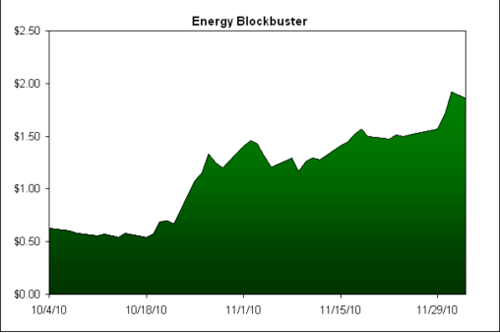 Solar energy stocks are a relatively new addition to Wall Street. The stock market took a recent turn for the worst, and while the financial sector is regaining a foothold on normalcy, some investors are looking for more trustworthy stocks to invest their money in. There is a possibility that solar energy stocks could be good choices for a post recession portfolio. There are several good analysts now that track solar energy stocks and as the Solar Energy Market continues to grow and the market matures – more people will be looking at some of the impressive returns that have been made in this market. Here are two stocks I think could do well in the next 12 months. Besides the big solar panel makers, there are also some "below the radar" companies that are developing some very exciting new products. For example, here is a US company that is traded on NASDAQ with the trading symbol NENE.OB that I think has an excellent potential. When I started following this stock personally in September 2010 the shares were around $0.60. When I posted the article about the company to this site in mid November the shares were at $1.42 and today they reached $2.21. (I hope you followed my advice in mid-November). To learn more about the Solar Window™ Technology that investors are excited about read my article. Another one of the solar energy stocks that some experts thinks will do well – no matter what the market does next year - is Yingli. To read more why they recommend the company – read the article I published Click Here. Like I said in the beginning – I am not a professional stock picker – just someone who is involved in developing solar projects and is doing a lot of research regarding what is going on in the market for my own benefit. As always – do your own research and good luck ! !